Thy Hand Hath Provided: Open Fields Giveaway! This giveaway is closed. Please go here to see who won! "I am the wife of a military doctor and a stay at home mom to a beautiful little girl. I love visiting antique shops, thrift stores and yard sales - always on the hunt for that "perfect" treasure! I have always loved decorating my home with my own hand-sewn pillows and curtains. Recently I decided to share my passion for making pillows with others by selling them in my Etsy shop." Visit her Open Fields Etsy shop. Come back here and in the comments tell Abbie and I what item you would choose if you won (keep in mind, it must be an item priced $15 or less). If you want to mention other items you love, you may do that, too. Please one comment per household. If you comment Anonymously, please leave me initials so I can identify you if you win. I will draw a winner sometime next Monday (November 28th)! If the winner does not contact me within a week, I will draw another winner. To Receive a 20% Discount from Any Item in Open Fields: Enter thyhand20 at check out! (This coupon code will expire Monday, November 28th). 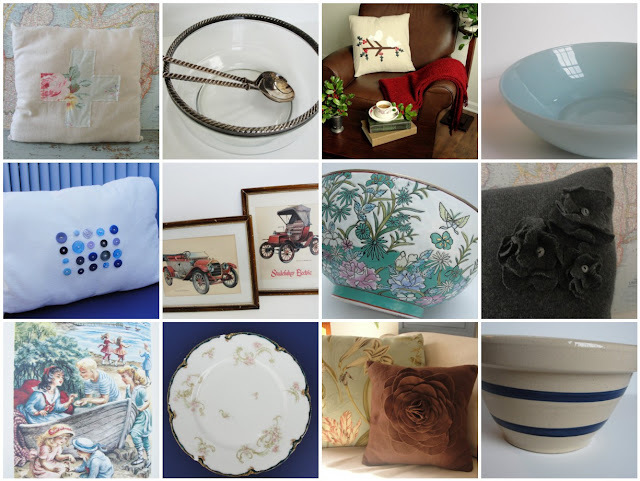 I'm torn between the turqoise butterfly bowl and the vintage cars prints. What a lovely Etsy shop! I love the blue mason canning jar! I can totally picture that on my kitchen windowsill filled with bright zinnias in the summertime! Thanks for a fun giveaway! I would pay the extra dollar for the bowl with blue stripes!! I would choose the brown velvet petal pillow. Gorgeous store! The sugar and cream bowl are a top pick...they remind me of my grandmother and her love of antique dishes. I like the Turquoise FireKing Anchor Hocking Vegetable Bowl. I would love the nautical blue wool whale pillow! Such a sweet design! Take Care. The brown rose felt pillow is beautiful...I think I'd pick that. Though the Blue Ball glass canning jar would be a close second. Thanks for the chance...fellow military wife here. The ball canning jar! Lovely flower vase! The brown felt flower pillow is adorable! Lovely homey items!! First of all thank you for giving us a wonderful chance to win something beautiful! The silver and glass bowl with spoons really caught my eye! What a beautiful piece! how fun! and what a pretty shop. I love the Jack and Jill book or the neat glass bowl with rope trim. I love her pillows! But I would probably choose one of the antique Louisa May Alcott books! She is one of my favorite authors ever. I love the brown flower felt pillow! It would be so beautiful in my living room, which lacks decorative pillows. It's actually been quite hard to find cute brown pillows. There are many other cute things in this shop, especially all the other pillows! The Lady of the Lake book or the Haviland Limoges plate. The plate would be used every day and the book would be read and then used for a tablescape..
You did a beautiful job on the Brown Felt Flower Petal Pillow! We recently remodeled our bedroom and the colors are latte brown and black...and this pillow would add the "pop" our bed needs. You do very nice work and it was a pleasure looking at your Etsy page. I would get the "vintage glass and silver bowl". So pretty!